Posted: Saturday, March 12, 2016. 10:02 am CST. 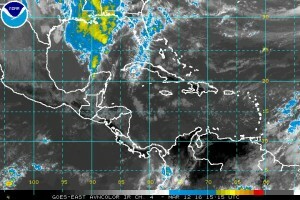 By BBN Staff: The National Meteorological Service of Belize is calling for a gusty and southeasterly airflow. This airflow will support warm and relatively unstable conditions over our area. The 24 hour forecast is for sunny skies with some cloudy spells today and mostly cloudy tonight. A few showers and isolated thunderstorms will occur mostly inland and in the north this afternoon and in the south later tonight. Winds blow east to southeast at 10 to 20 knots with occasional higher gust. Sea state considered moderate to rough. High temperatures are expected to reach 86 degrees Fahrenheit in the coast, 93 degrees Fahrenheit inland and 81 degrees Fahrenheit in the hills. Low temperatures are expected 78 degrees Fahrenheit in the coast, 73 degrees Fahrenheit inland and in the hills 68 degrees Fahrenheit. A high tide is expected at 12:20 p.m. The sun will set in at 6:02 p.m. The general outlook through Sunday is for cloudy spells with isolated thunderstorm inland becoming mainly fair with little or no rainfall on Sunday night.